D is for Doctor. Doctor Nicholas Brandwood is the GP in Cadblister Parva. 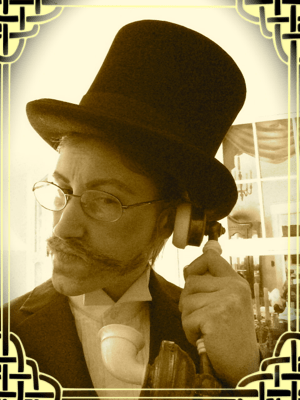 Doctor Brandwood woke to the sound of the telephone. His wife (now eight months deceased) had insisted on having it installed two years ago, and, in his heart of hearts, Dr. Brandwood agreed that it had many practical advantages. But his habit upon hearing the ring of “that accursed instrument” was to swear horribly. Dr. Brandwood swore horribly now. Then he went to answer the thing. As he passed the grandfather clock in the hall, he saw that it was just on 3 in the morning, and, seeing this, he hurried his step. He’d learned that calls that came at 3 A.M. were either sharp, sudden crises or calls that ought to have been made several hours earlier- that is, genuine emergencies. “Do you mean she’s dead, child?” Dr. Brandwood’s voice was less of a bark than usual. He approved of Lady Belinda, and thought she’d had quite enough to put up with without being growled at by sleepy GPs. “I’ll be there in half an hour.” And Dr. Brandwood cut off Lady Belinda’s effusive thanks by the simple expedient of ending the call. That was one thing he liked about the telephone- it was very easy to dispense with unnecessary civilities. In rather under five minutes, he was dressed and striding down his front walk, his black bag in one hand and a torch in the other. It was still snowing. Still, the walk would do him good, wake him up a bit. It was no weather for motoring. He set off down Main Street at his usual brisk pace, and soon reached the lane that led up to the Hall. He turned on his torch and started up the slight slope. And then his torch showed him something that made his steps become brisker yet. Something was lying in the snowy lane. And by ‘something,’ Dr. Brandwood rather thought he meant ‘someone.’ The snow had performed a partial and un-reverend burial, but it had not yet effaced the basic shape of the human figure. He crouched next to where he thought the head would be and started to dig. After a moment, he leaned back and whistled. “Well, one thing’s certain sure: there will be no dearth of suspects,” said Brandwood, and hurried back to town to wake Constable Wilkins. An hour later, Dr. Brandwood finally arrived at the Hall. “Your brother is here, then?” Dr. Brandwood asked. Lady Belinda nodded. Dr. Brandwood looked closely at Lady Belinda. He didn’t like her nervous, jerky movements or the flush of too-bright colour upon her cheeks. Her eyes, too, were red and swollen. She’d had a bad night. Well, he was about to make it worse. No help for that. The only question was whether he should see his patient first and then break the news to Lady Belinda, or if it would be best to get it over now. Now, he decided. If he went up to the sick-room, Lady Belinda might quite naturally go off to bed. If he told her that he had something to tell her and asked her to wait up until he was finished with his patient, she’d be in a state of dreadful anticipation during the whole of his examination, and it looked like her nerves were badly strained already. No, now was best. He crossed to the drawing room and opened the door. “I’ll go to her in a moment. Come, please. It is rather important.” When she’d sat down and he’d succeeded in locating the brandy decanter, he came out with it. “Your father has been murdered,” he said. “Sensible girl,” Dr. Brandwood approved. “I’ll be back presently. Have some of that brandy, now.” And Dr. Brandwood went up to his patient. She has a butler? It was the butler. Definitely. Butlers are indeed shady characters, I agree. I agree: it was definitely the butler and I’m so excited to have found this blog through the A to Z challenge. Also, thanks! Yay! I am glad you found this blog, too! Yours is v. spiffy, too! Really enjoyed this. Lady Belinda’s reaction was quite interesting. I wonder whether she heard something from Theodolinda. Liz- I congratulate you on your wonderfully suspicious mind! Theodolinda is certainly a very suspicious old lady. Why, one might ask oneself, has she been masquerading as a Crabtree for the last 30 years? Who, one might further wonder, is she really? And what happened to her out in the snowstorm before she came to herself? The plot continues to thicken. Love the photos. Hey Lori! Thanks! I’m enjoying dressing up for them a lot, and seeing how many different people I can look like. I have for this purpose ordered a quantity of false hair, a lot of spirit gum adhesive, some theatrical makeup, and even some of that theatrical putty stuff actors use… fun!